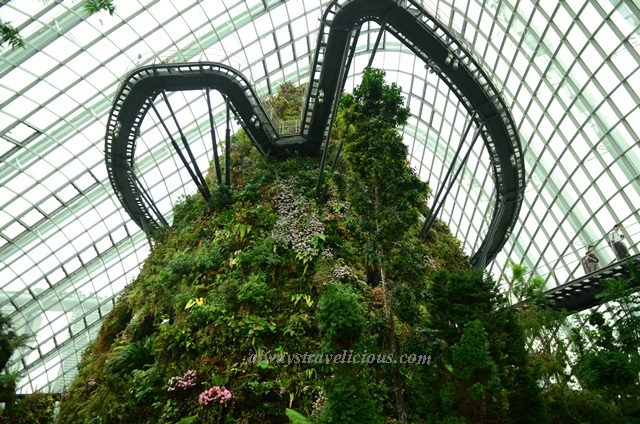 Cloud Forest @ Gardens by the Bay, Singapore - Always Travelicious ! 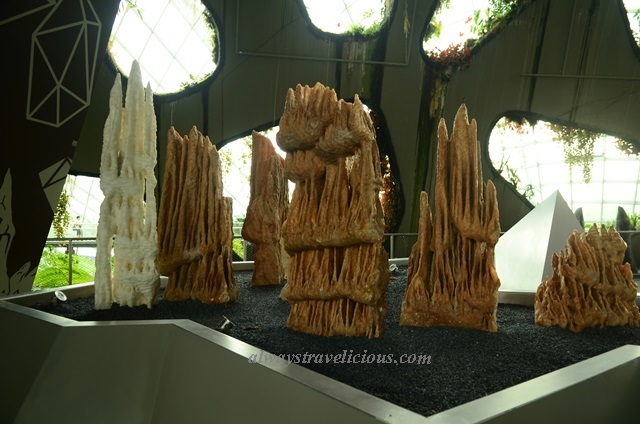 Knowing that the two domes are giant greenhouses, we entered the Cloud Forest Dome thinking we will see flowers, trees, plants and all, in which we did, but it was much more spectacular than that where all the plants were growing on a little “mountain”. Even more remarkably, there was a waterfall, pouring down from the mountain; definitely not something I was expecting from this giant dome ! The waterfall was so close to the entrance we could feel flickers of water droplets on our skin. The mountain isn’t a solid one with mud and rocks, but a man-made cement building with built-in plant pots to create a plant wall – though it was still impressive to see. After all, mountains are not something that you would expect to see in a greenhouse. We walked around the surreal compound in awe, admiring the bizarre bridge and the mountain from all angles. The temperature was cool and it almost felt I was visiting a mini Cameron Highlands. 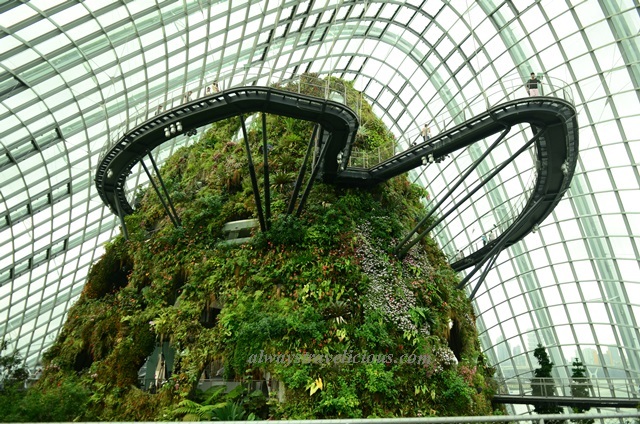 The plants that you see here are specifically the ones growing in tropical rainforests at the height of 1000m to 2000m. The climate too is reproduced to match the temperature, moisture and humidity at this height. 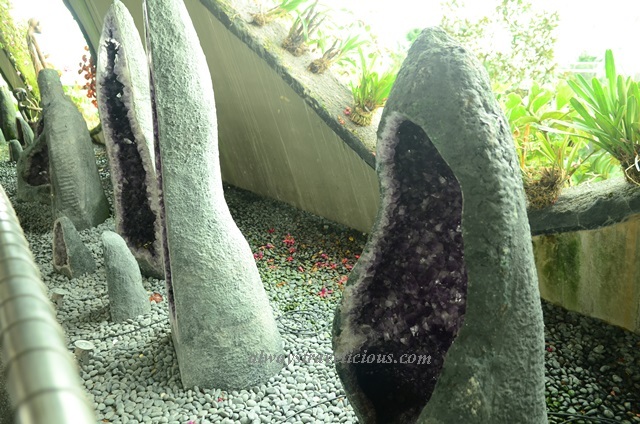 It is no coincidence that the place feels like a mini Cameron Highland because Cameron Highlands is in this height category and blanketed with tropical rain forests. As you ascend the mountain, there are different things to explore on each level. 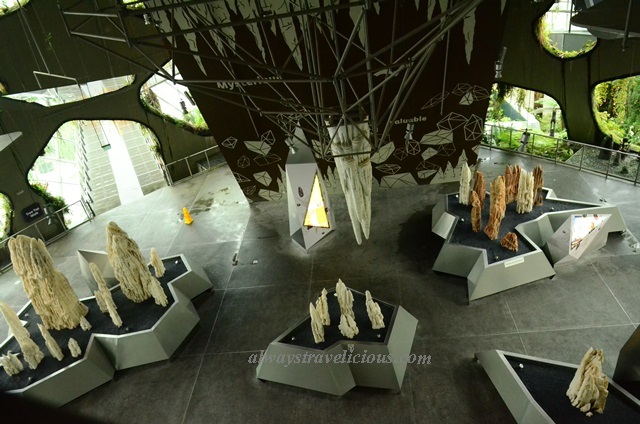 Level 4 is “Crystal Mountain”, showcasing various types of crystals and stalactites; it is also where you do the “Tree Top Walk”, which is set to be 30 m above the rainforest floor. Aerial view of Tree Top Walk. The Cloud Walk is also on Level 5 where you get really close to the waterfalls and glass panels – I remember reading somewhere that these panels are coated with special material to prevent too much heat from entering. You get fantastic views of Supertree Grove and Marina Bay Sands on this level too. Finally. on the highest level, mimicking conditions at 2000m above sea level is where the “Lost World” is. Adult: $20, Senior Citizen $15, Child $12. Th maintenance cost must be expensive and it must be maintained properly. However, knowing Singapore, they would be able to maintain this place properly. I never thought about the maintenance – must cost a bomb to keep the huge place so cold all the time ! You really read things in detail…. right till the end… hehe.. Yes – $1 is a big typo! And when I love a blog (such as how I love yours), I will read every bit of the details and not only stare at the photos. Haha.